Your new Beauceron puppy, as well as many other herding and working breeds, must have extra socialization to develop the proper temperament for the rest of their lives. A Beauceron is naturally aloof and prefers to not be around or near strangers. The Beauceron should not be shy or fearful of strangers nor should they attempt to bite. A proper temperament in a Beauceron allows a stranger to approach and pet the dog without showing signs of fear or aggression. The socialization you provide during the first year of your puppies life will help determine if the puppy grows up to be shy, self assured, or aggressive and a biter. Much of a Beauceron’s temperament is inherited from its parents. This is an excellent reason to get to know the breeder and visit their kennel. The ideal breeding is one where both the sire and dam have ideal temperaments. They are neither shy or aggressive. However, this is not always possible. Breeding decisions are based on several factors like inheritable diseases, physical traits, and temperament. Breeding decisions are based on the gene pool of good and bad genes. It isn’t uncommon to find one parent with a good temperament and another with a shy temperament. However, dogs with shy temperaments should not be bred together. At least one of the parents should have a stable temperament. Those offspring should then be bred only to dogs with good temperaments. An aggressive dog should never be bred. Breeding an aggressive dog does not produce a protective dog, it produces a dog that bites strangers, relatives, and their owners. When you get your puppy, daily socialization is a must. The more that your dog is handled by strangers, the better. Take your puppy to the park, pet stores, everywhere dogs are allowed. This must be done daily until one year of age. A Beauceron develops shyness because they are unsure of themselves. They lack self confidence. They should be exposed to loud noises as much as strange people. Trains passing, loud rock bands, gunfire, motorcycle noise, trucks or traffic and crowds at sporting events are all examples of noises that can intimidate your puppy. The more exposure to these things will improve your chances of developing a good temperament. A puppies natural desire to explore should be encouraged. They need exposure to unfamiliar items like jungle gyms, children’s toys (especially if they make noise), balls, pull toys, bicycles, wheelchairs, canes, and any other item that is not normally around your home. Also, if there are no children in your home, find some. Exposure to all age groups is important but especially children. Children are small, loud, and prone to quick movements. As a last word, if you are looking for a protective dog, a Beauceron is just what the doctor ordered. A Beauceron is naturally protective if it has a good temperament. It will tolerate being approached by strangers without fear or aggression and yet protect it’s family with it’s life. A shy dog will bite out of fear and an aggressive dog will bite everything. Your efforts in socialization during the first year will help determine a proper temperament. All dogs need training! You may have owned many dogs all your life and have never had any problems. Please don’t let your first problem be with a Beauceron. As a dog trainer, I can tell you that a well-trained dog begins with a well-trained owner. A poorly-trained owner may result in a Beauceron that barks incessantly, is aggressive, and bites. A Beauceron like this usually ends up in a shelter because the owner cannot control it, and the breed gets a bad reputation. A Beauceron puppy should attend a puppy training class with its owner. You will learn how to relate to your dog and how to be a leader. Beaucerons are very easy to train. Of course, you should start with house-training your new puppy. Please purchase a crate that can be adjusted for size. This is usually a separate screen that can be moved back and forth in the crate. Allow enough room for the puppy to lie down but not so much room that the puppy can mess its crate and lie down without getting into the mess. A dog will try to stay clean and not soil its living quarters. When you get the puppy out of the crate, immediately take the dog outside until it does its business. Don’t worry, it won’t take long! When you get outside, tell the puppy repeatedly to “get busy” or “hurry up”. Before long uttering this phrase will stimulate a response in the dog that will stay with it all its life. Feed your puppy only twice a day. Put the food down for 15 minutes then pick it up until the second feeding. When your puppy stops eating, immediately take it outside. You will soon be rewarded with number 2. Naturally, as with all training, when your dog performs as you want, lavish praise is expected and required. When walking your Beauceron, the training starts before you leave the house. You are in charge and as the leader, you should go out the door before your dog. Do not allow the dog to lead you out the door. When walking, your dog should be by your side, not out in front of you. I recommend that you use a choke chain and a loose lead as long as the dog is by your side. If your dog starts to get out in front of you, a quick snap of the lead will remind your dog to walk beside you. It should be combined with a verbal command like “heel”. It won’t take long before your dog responds to the verbal command alone. There are many other training tips that a qualified trainer can help you with. It is well worth the investment to find a qualified trainer to help you with your Beauceron. There are many different training methods and your trainer may use a method that you are unfamiliar with. Please give it a chance to work before you dismiss it as worthless. Different breeds respond differently to various training methods. A Beauceron is sensitive and only wants to please its owner. Undesirable behavior can be corrected with a sharp command or scolding. Your Beauceron will be crushed because you are displeased with it. You might have noticed that earlier, I recommended a correction with a snap of the lead while walking. This is about as strong of a physical correction as will ever be needed. While the Beauceron worships the ground you walk on, too severe of a physical correction will result in your dog defending itself. The Beauceron is pretty much a wash and wear dog. They don’t require much attention to keep them in good shape, but like all dogs a certain amount of care is required. The first thing to consider is of course immunizations. When you get your puppy you should receive a record of worming and shots already given. Take this record to your veterinarian so they can establish a record and determine a correct protocol for maintaining the good health of your puppy. While there is some discussion of how often immunizations are necessary, regular worming (especially heart) should be done monthly, no matter where you live. Your veterinarian can explain the latest data. Coat care is relatively simple. The Beauceron has a harsh, weather-resistant coat. It has more natural oils than some breeds, to help repel water and keep the dog warm. This natural oil tends to attract dirt and a monthly bath should be sufficient to keep your dog clean without compromising its weather-resistant properties. Bathing too often will wash away these protective oils and should be avoided. A Beauceron sheds hair constantly and bathing tends to loosen the coat and produce more discarded hair. After the bath, plan to give your dog a good brushing to reduce the amount of hair everywhere. If you don’t want to brush, we recommend the purchase of a blow dryer for dogs to get rid of this loose hair. It can be used to dry the dog and help to eliminate shedding. Don’t use your own hair dryer, it’s too hot and not powerful enough to blow away the loose hair. Go to a pet store and purchase a blower made especially for dogs. Keeping expenses to a minimum is always a good idea but now is not the time to cut corners. Expect to pay more than $125 for a minimal blower that can do the job. Some blowers that are extra powerful can cost $400 or more. The advantage of a powerful blower is that you virtually eliminate all the loose hair and can forget about it until the next bath. Twice a year dogs will turn over their coat and they shed more than normal. This usually happens in the fall and early spring. During these times, brushing twice a week or blowing out every two weeks is necessary. The cycle of heavy shedding is over in about a month if you use a blower. It takes longer with just brushing. The Beauceron has double dewclaws on the rear legs. It is a trait of the breed and they must be there if you plan to show your dog. This adds two extra nails on each rear leg that must be kept trimmed. It’s easy to overlook proper nail care for dogs but it can have serious consequences. Nails that are allowed to grow too long put excess pressure on the toes and will eventually cause them to break down. Severe cases can cause the dog to become lame and the condition is permanent. Trimming the nails after this happens cannot correct the condition. Unfortunately, all dogs hate to have their nails trimmed. If you don’t have a grooming table to put them on and help control them, this process can be quite challenging. If you don’t want to trim the nails yourself, plan to take the dog to the vet every month. We recommend the use of a grinder to file the nails. A clipper can be used but you take a chance of cutting too short and into the quick. This is painful, bleeds, and makes an unpleasant experience for the dog causing greater resistance for the next time. In the wild, canines are meat eaters and chew bones and other materials that keep the tarter off their teeth. Domesticated dogs eat man made foods that allow the buildup of tarter, causing dental problems. Dogs can be trained to tolerate teeth brushing and you can purchase tooth paste and brushes at most pet stores. There are also chew toys available that can help reduce tarter. If tarter does build up then professional cleaning by a veterinarian is required. Unfortunately, this requires sedation of the dog and there are inherent risks involved with it. These risks increase as the dog gets older. There is nothing more important to your dog’s good health than nutrition. A premium dog food is worth it’s weight in gold. Beware, not all dog foods are created equal. Your most important tool in selection of dog food is the label but they can be quite confusing. Therefore, we will try to make this simple so you have some idea of what you are buying. The first rule is to understand the terms by-products and meal. As an example, if you see the product contains chicken meal, that means the whole chicken was processed and contains everything. If the label says chicken by-products then that means it is mostly feathers, beaks, feet, and other parts of little value. In short, meal is better. The next thing to remember is to avoid corn. If the word corn appears in the first three ingredients on the label, find another brand. Corn is used as a filler and makes the dogs feel full. Unfortunately, it has little nutritional value for canines. Ingredients on the label are listed in descending order of percentage in the food. In other words, if chicken is the first ingredient listed then it has the highest percentage in the food. The next ingredient has the second highest percentage, and so on. The better the dog food that you feed means that you don’t have to feed as much to achieve the required nutrition. It also means there is less to pick up after your dog removes the nutrients. That’s always a plus. The following information is based on personal experience and information from other sources. We are not qualified veterinarians; you should do your own research as well as talking with your own veterinarian. All information given is to the best of our knowledge and we are not responsible for any misinformation. Dogs are no different than humans when it comes to getting sick and having health problems. All dogs come from a single source; their heritage can be traced back to the wolf. As dogs developed they sometimes had physical variations that humans found desirable. As an example, there may have been a dog with spots that were attractive. That dog was then bred with other dogs that had a similar genetic variation. As these dogs continued to be bred, the recessive gene that caused the spots was concentrated in the offspring until all of them had the same characteristics. In other words, spots. This is the way that all purebred dogs were developed and is what gives us the individual breeds. Unfortunately, not only are the desirable genes concentrated but also some undesirable ones as well. This is why some breeds are more prone to genetic problems than others. When a dog has a recessive gene for deafness, that doesn’t mean the dog will be deaf. However, if that dog is bred to another dog that has the recessive gene for deafness, the probability of the offspring having deafness is increased. When two dogs with the same recessive gene are bred, then, according to averages, one half of the litter will carry the deafness gene but not become deaf. One fourth of the litter will have the deafness gene and be deaf. Another one fourth of the litter will not have the gene and will not be deaf. When responsible breeders test their dogs for genetic defects such as deafness, they do not breed dogs that display deafness and increase the chances that their offspring will not carry the gene. This is a very simplified explanation of how different breeds of dogs are created genetic defects are passed to offspring. All pure bred dogs have genetic defects that are more prone to occur in their specific breed. When you consider getting a dog, you should be aware of the individual breed’s propensity to produce specific genetic defects. Do not consider getting a puppy whose parents have not been screened for the common genetic defects in that breed. 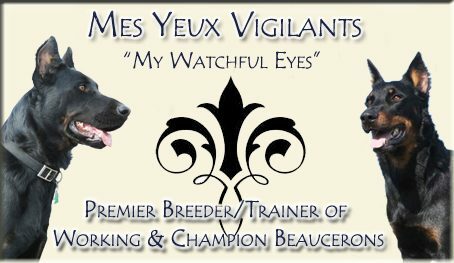 Beaucerons are no different than any other pure bred dog and have certain issues that should be screened for when possible. Like many large breeds, the Beauceron is prone to hip and elbow dysplasia. This is a genetic defect that causes pain and lameness. Some dogs are only slightly dysplastic and no action is required; others may require surgery or even euthanasia. Dysplasia in the Beauceron occurs in about 14 percent of the breed. A reliable check for dysplasia cannot be done before the age of 24 months and there should be a record of it with the Orthopedic Foundation For Animals or OFA. When buying a puppy, check to ensure the parents have been screened for hip dysplasia. This doesn’t mean that your puppy will not develop dysplasia but your odds are better. While no significant genetic eye problems are known in the Beauceron, it is a good idea to make sure that the parents had a CERF exam before breeding. The Canine Eye Registration Foundation records the results of eye exams for dogs and maintains the record for one year after which time the dog should be reexamined. Dilated Cardiomyopathy or DCM is a serious disease that causes inflammation and weakening of the heart muscle. Although there is evidence that the condition is hereditary, there are still many things unknown about the condition. DCM can occur at any age and as of yet, there is no genetic test. Some breeders have their dogs tested for heart disease but since it may not show up until late in life, testing is of limited value. It is more important to know the health history of ancestors and if any have DCM problems then a decision must be made based on prevalence and how far back it occurred. Of course this will depend on the cooperation of the breeder and if your dog develops the disease, it doesn’t mean the breeder was aware of any issues. Bloat or Gastric Torsion is commonly found in large breeds of dogs. Some breeds like the Great Dane have a high likelihood of developing this serious problem. It is the second highest cause of death in many breeds, and would be the highest if we could eliminate cancer. Fortunately, Bloat is not highly prevalent in the Beauceron. However, to reduce the risk of Bloat, feed your dog smaller amounts at least twice a day. Keep activity levels low for a least an hour after meals. Keep a close watch for swelling in the abdomen. If Bloat does develop, medical attention is critical and should be given within the first hour. After an hour, the chance of survival is poor. There is no known genetic test for Bloat and you should consider ancestry before obtaining a puppy. Osteochondritis Dissecans (OCD) is a separation of the joint cartilage from the bone, usually in the shoulder although it can happen in other joints. It is believed to be a genetic defect that causes a weakness where the cartilage attaches to the bone. It is prevalent in large fast growing dogs and occurs during the first year. Caught early enough the effected dog can be kept confined and activity limited so the cartilage may heal. However, a condition that has progressed requires surgery. It is important during the first year of life that a puppy not be allowed to jump from heights or other activities that put stress on the shoulders since this can bring on the condition in a growing puppy. Ask your breeder about history. The Beauceron is a fairly healthy dog and you should not be discouraged by the health issues mentioned here. Beaucerons do have other issues but they are relatively minor in occurrence. It is best to ask your breeder about history and any known problems with their particular line of dogs. This entry was posted in About the Beauceron, Beauceron Care, Before You Buy on January 15, 2017 by myvbeauces.